As part of our series on leadership training, Susanne Madsen, Leadership Coach, discusses tips and strategies for motivating different people on your team. 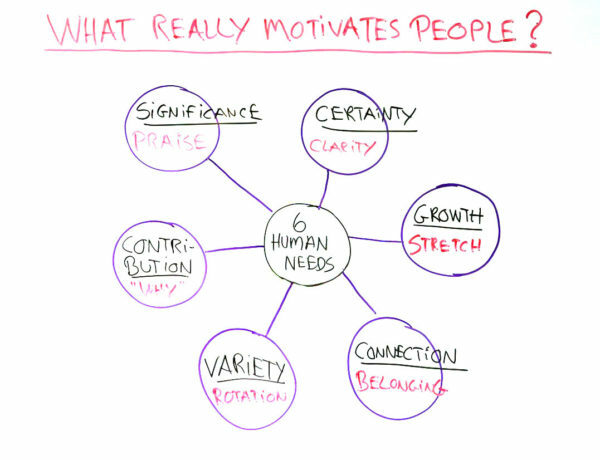 In Review: What Really Motivates People? Using Anthony Robbins’ definition of 6 Human Needs, Susanne demonstrates how project managers and team leaders can identify core human needs for effective motivation strategies for their teams. By getting to know the needs of your team members, you can help them to feel connected to the broader project goals and keep them aligned and motivated with their work. Pro-Tip: Make sure you are communicating the purpose and strategic goals of the project with your team frequently. It’s valuable for all team members to understand their role in the larger project and their contribution to the end user, as well. Take it further: Watch Susanne in her previous leadership training video: How to Build Trust with Your Team. I’m Susanne Madsen. 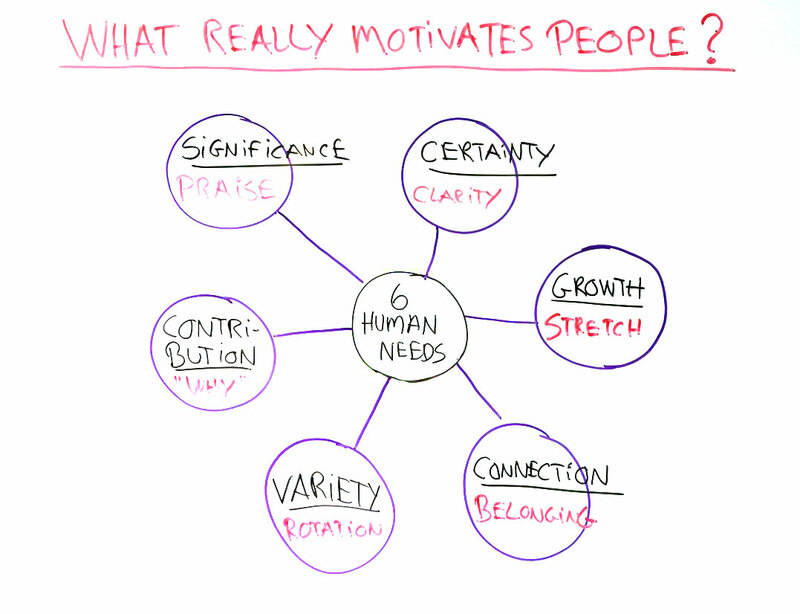 Welcome to this whiteboard session on ‘What Really Motivates People’. Today we’re going to look at the six human needs as taught by Anthony Robbins. The first human need is certainty. We all have a need for safety, security, certainty. We want to know that we are being paid and that we have a job, etc. You can help your team members fulfill this need by giving them clarity around what their roles are, what their responsibilities are, why the project is there. What they are going to be doing after the project, etc. The more clarity and certainty the better up until a certain point, because what happens if I give you 100% certainty. You might get bored. So the opposing need is variety. We all have a need for change, for some spice in life. You can help your team members fulfill this need by making sure you rotate them, by making sure you don’t keep them doing the same thing over and over again because that might bore them and it might demotivate them. The third human need is significance. We all have a need to feel special, to stand out. I think of this as a bit of an ego driven need. You can help your team members to fulfill this by praising them but your praise must absolutely be heartfelt and honest and you must link it to a specific behavior they have done so that they know that it’s true positive feedback. The opposing need to significance is connection. We all have a need to feel connected, to feel part of a team. We are human after all. You can help your team members to get this need fulfilled by having one on one conversations with a person, listening to them, asking them how they’re doing, making them feel they belong. You can also create team building exercises to create that sense of belonging at a team level. But according to this model, we will never feel truly fulfilled purely through these first four needs. We need the last two needs to feel fulfillment. That’s growth and contribution. Growth means that we all have a need to develop, to progress, to grow. You can help your team members to fulfill this by stretching them, by delegating tasks that would generally stretch them. You can also allow them to go and explore outside of the team or attend conferences. That will also make them feel that they’re growing. Lastly contribution. We all have a need to feel that we are part of something bigger. That our efforts matter. That’s why we contribute to the Olympics for instance and that we participate without even getting a salary for it. You can help your team members to fulfill those needs by making them feel their efforts are truly worthwhile. That what they’re doing will add value to an end user somewhere after the fact. So I would like to ask you what are you doing to help your team members fulfill all of these six human needs. When you do that, you will truly motivate them. Thank you for watching. Please visit again at ProjectManager.com.